When I started my garden at Bellis in 2003, it consisted of Queensland Blue couch, fences and a house. Starting a garden completely from scratch is a rare opportunity for many gardeners. This was my first chance. I wanted to record the transformational effect of gardening sustainably. One way to record progress was a species checklist supported by photos…but where to start? Using Bowerbird I can have unknown species positively identified by Australian experts. By keeping a checklist of visitors I could see that pests were fastest to move in, but shortly afterwards in come some of the biocontrols their activity attracts. Both indigenous and introduced biocontrols have visited or now call Bellis home. Species 376 is the Argentinian fly Trichopoda giacomellii, a biocontrol of the native and pesky Green Vegetable bug (Nezara viridula) a relative of stinkbugs that attack many vegetable crops. Reading up about these Curious Garden Creatures as I discover them allows me to learn how they fit: are they beneficial or not-so-beneficial? Or just biodiversity, plain and non-threatening? Species 399 is a rare cranefly. It lives its modest life here. Their baby curl grubs nibble roots so microscopically they do no harm. 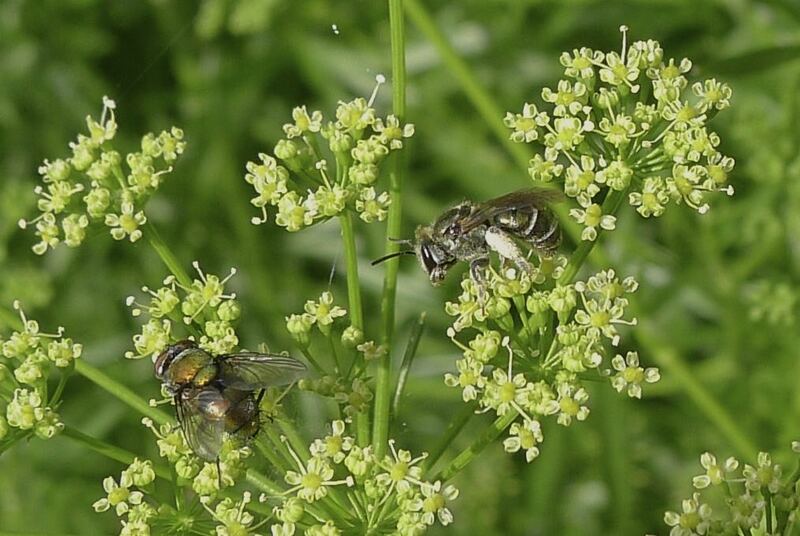 Collectively, native bees and wasps can influence our success as gardeners. It’s interesting – and possibly useful – knowing how to manage them in a suburban garden ecosystem. When the world’s getting hungrier and 40% of our food comes from crops pollinated by European honeybees, you don’t want a scarcity of honeybees. Yet it remains pressing, growing risk to settled society. The latest news on bee-killing pesticides based on synthetic neonicotinoid poisons is that not only do they contribute to colony collapse disorder to honeybees, but that these poisons are addictive. Bees get addicted to plants poisoned by products like Confidor just like people get hooked on cigarettes. My checklist records two species of stingless bee. Tetragonula hockingsi isn’t local, it’s a tropical species. Since the tropics are expanding southwards roughly at a rate of 1km a year, this tropical bee should enjoy an increasingly warm Brisbane. The other, T. carbonaria, is local subtropical species. I’m happy to report that stingless bees in my garden thrive particularly well and are generalist pollinators. They will work flowers alongside honeybees without problems. Stingless bee hives have regularly and consistently grown in size, adding 2 or 3 kilos each year. This has been happening for several years. I got my first stingless bees with hives from Dr Tim Heard, a Brisbane-based Australian bee expert. Black English Honeybees (which came with the first settlers) and Italian Honeybees (their less temperamental successors) are still here. Though few and far between, these lonely individuals do help here and there. By contrast, I have plenty of native bees in my garden on warm or sunny days. Pumpkin is the only crop I seem to have to pollinate by hand to get good fruit set. Meet Species 459 recorded at Bellis. Halictid bee, Austronomia flavoviridis, couldn’t resist the nectar of my Italian flat-leaved parsley. This is the 23rd species of Australian bee providing pollination services to productive plants in my garden. It’s particularly abundant in south west Western Australia. I updated Hive Society, my bee and wasp gallery. I’m not 100% sure if I’m gardening 100% beyond honeybees, but I draw comfort from what I grow and eat, courtesy of a diversity of local native pollinators. Results? I’ve currently got 115 different edibles on my menu, and this year’s seed harvest has been excellent. Apart from my own store of saved seed, I have around 800 surplus packets of seed. “Any fish will bite if you’ve got good bait” sang Rosetta Crawford in ‘Double Crossin’ Papa‘ (1939), one of my Dad’s favourite jazz songs. Fair comment, love the song, but in the garden it helps to know which bait, be it pollen or nectar (or both), and also which shape of flower, provide the right combination (‘bait’) to attract certain species. I’m having fun observing and documenting these little discoveries. Currently I’ve identified 467 species, the tip of the iceberg, and guess what? Very few are serious pests. More are helpful and most are harmless. And native bees seem accepting of many exotic species. I encourage gardeners to take a closer look at garden biodiversity. Even if you don’t want an inventory, check out Bowerbird, it’s a great resource for identifying those native plants and animals.